Over the past few months I've had a few commissions for gig posters - something I find super fun and have always wanted to do! My friends over at MadeInUtica.com commissioned me for a poster for their upcoming Soul Train event with The Adirondack Scenic Railroad. I wanted to intertwine the look from the Soul Train music variety show from the 70's/80's era with an iconic image from Utica. Because the train ride is starting out at Union Station the obvious pick was the outside facade of the building (although I also threw around some ideas with a skyline and a train landscape). I'm a big fan of Filmore Posters from artists like Brian Graham and Bonnie MacLean - so you'll definitely see their influence here in color and style. The Soul Train poster will be given away with event ticket purchases which can be made at the Adirondack Scenic Railroad's website, at the train station, or at MadeinUtica.com. I've also been creating posters for DJ Ease One's gigs at Lukin's Brick Oven Pizza on Varick Street in Utica. DJ Ease One plays a mix of hip hop and R&B with some classics in the mix. Go see him you'll have a blast! Here's some pieces I recently finished up, reworked from sketches I created a few months ago. These are some of the more recognizable historical buildings in the village of Clinton, NY - where my studio is located. The Allen Building is where my studio has been located since 2011. The Allen Building, Clinton NY. Digital mixed media with watercolor and ink. 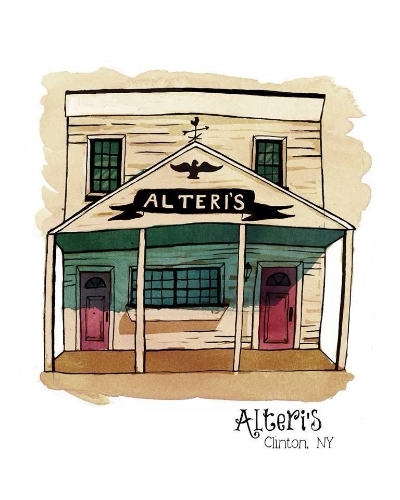 Alteri's Restaurant, Clinton NY. Digital mixed media with watercolor and ink. Hogan's Corner, Clinton, NY. The current home to Cafe J. Digital mixed media with watercolor and ink. Prints of these pieces are currently available at Signature 81's new location, 17 College Street, Clinton NY. Retro Sorrento was created online by artist and illustrator Maria Vallese in 2009 as a way to sell both her artwork and her handmade jewelry and accessory designs. She has since expanded to selling at several craft shows, gallery shows and farmers markets in the Upstate NY area. Maria's blog is a way to keep up to date with her latest commissions and shows, along with upcoming events. You can also find Maria's work on Etsy, and on several other social media outlets.